The Boston Liturgical Dance Ensemble is an artistic company committed to the integration of dance and religious expression. 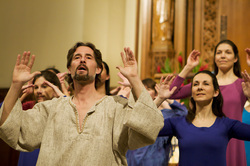 As a nonprofit organizaion with outreach to the community, the company's work is threefold: performing of sacred dance works in theater and church venues, promoting educational workshops and classes in sacred and liturgical dance, and integrating dance ministry in liturgical prayer and worship. In 1978, Reverend Robert VerEecke, S.J., fondly known as Father Bob, began working with the student dance company at Boston College (BC) in his role as Jesuit Artist in Residence. The group danced for special university liturgy services such as Palm Sunday and Baccalaureate as well as dance retreats. Dancers from the community were also involved at this early stage. Because Boston College did not have a dance program at that time, the group took lessons from Margot Parsons in Newton. In 1980, seeking to create a means for dancers who were then alumni to continue to participate with the ensemble, Father Bob formed his own ensemble of BC alumni, current students, and local dancers interested in liturgical and sacred dance. That year the Boston Liturgical Dance Ensemble (BLDE) presented a concert of dances for Advent and Christmas in the Newton Chapel. About 75 people attended. The very next year the Robsham Theater Arts Center opened on the Main Campus of BC, and the Christmas production moved into the venue that would become its home for over 20 years. In 1984 the production became known as A Dancer's Christmas, and in 1990, the Boston Liturgical Dance Ensemble filed for official non-profit status. The company grew quickly over the years as increasing numbers of alumni continued ot perform in the production after graduating, local dancers joined the cast through friends and referrals, and children of the dancers and community began to participate as well. Many performers and production staff have been with the show for over 25 years - some since its inception. Last year the BLDE performed 9 shows of A Dancer's Christmas for over 2,600 audience members. A Dancer's Christmas finished it's 28 year run and a new creation took its place. 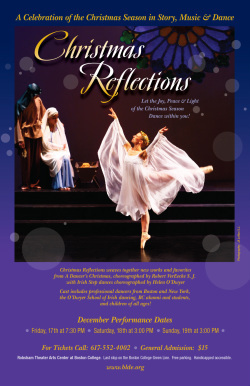 Christmas Reflections is now the seasonal celebration that the company offers. 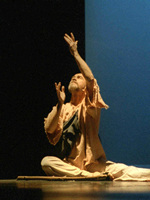 Some of the work of the BLDE is the integration of dance into religious services. Members of the company and others interested in the integration of dance and religious expression join together in the Lenten and Easter seasons for evening prayers. They also participate in special liturgies throughout the year.